It's March! 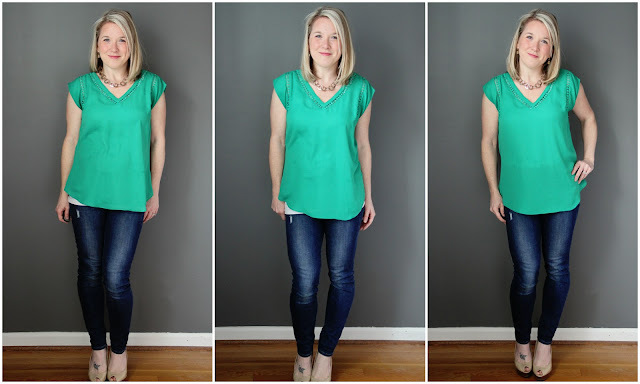 Time for another edition of Stitch Fix findings. 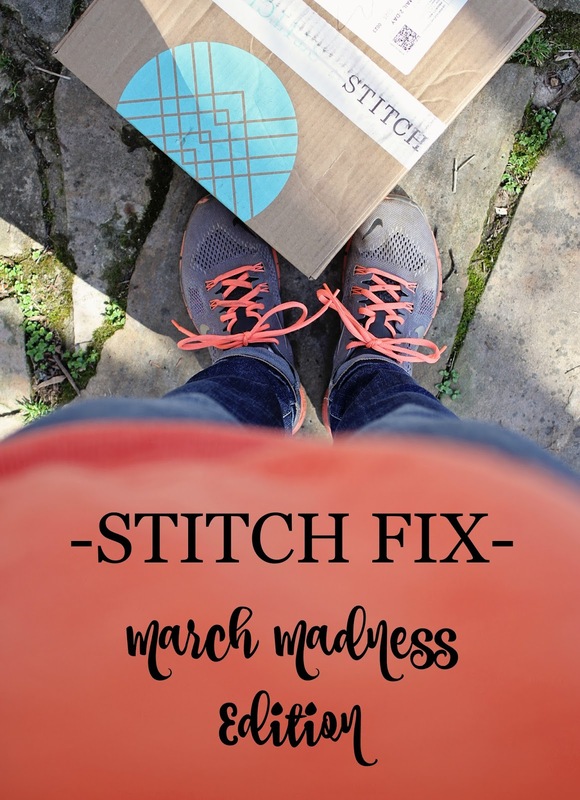 I know it's been a while since my last Stitch Fix post from late January. I received a box in February, but due to sick kids, a hectic work schedule and lack of good light in the evenings I wasn't able to take any photos. Womp womp...blogger fail. However, you didn't miss much. I was once again (for the 5th month in a row) paired with a new stylist. I'm really hoping eventually I find a stylist that really gets me or at least someone that will stick with me a couple months in a row and get to know my likes/dislikes. So far, no luck in that department. That month I requested a few specific items, which I've never done. I asked for a white v-neck shell to go under a blazer/cardigan/jacket, a pair of colored jeans (not red or green), a bright colored top and some fun moto leggings. I received one of those things - a bright colored top, which was the only item I kept. This was my first 1/5, which was disappointing. The other items they sent either weren't a good fit (over-sized plaid shirt, sweater with short torso) or weren't practical for my lifestyle ($200 white jeans!!! I have 2 messy kids...what were they thinking?). So, yeah...disappointed. I really wanted to love this top. The color is SO me. I love love love bright red. I also love that it's a v-neck and a bit dressier than a regular t-shirt. However, I just don't think the fit was super flattering. For one, the detail on the shoulders made them feel very broad. I'm petite, so it felt very widening, if that makes any sense. Also, I wasn't really a fan of the double pockets on the front. They hit in exactly the wrong place, if you know what I mean. My girls don't need any extra flaps up there. And finally, the buttons on the front were kind of heavy, which pulled the shirt down in the front and made it a bit droopy. Maybe I just needed a smaller size? I don't know. It looks pretty good in the photos and I love the color - I wish it would have worked out. This is another one I had mixed feelings about. On the one hand, this shirt was so incredibly soft and comfortable. But, on the other hand, it's a plain gray t-shirt. There's nothing fancy about it and I just had a hard time justifying the price tag ($44) for something that I felt like I could get at Rack for half that price. Plus, the color just completely washes me out. I'm too pale right now (and always) to pull this off. I was very disappointed to pull out yet another pair of skinny jeans. I've already purchased two pairs of jeans from Stitch Fix and didn't really need another pair. However, the minute I put these on, I didn't want to take them off. Like ever. These are the most comfortable pair of jeans I've ever put on. They fit like a dream and are so incredibly soft you could sleep in them. They're actually quite a bit lighter than the jeans I normally wear, so I feel like they're more casual and would perfect for running around after the kids on the weekends. Plus, they look great with my favorite Chucks. This bright blue floral skirt had so much potential. I love the colors and love florals, but it just didn't work for me. First of all, it was too long. I like my pencil skirts to hit at/above the knees, but this one hit below my knee (unless I hiked it up to my chest). Plus, there were 4 seams (front, back and both sides), which I didn't like. Every time I looked down I felt like maybe I was wearing the skirt backwards (I wasn't). The other issue I had was what to pair with this skirt - I felt like nothing I owned really worked with it. I tried on a number of options and didn't like any of them. And while I do work in a corporate office where this skirt would be appropriate, I just didn't see myself wearing it much. It's pretty and bright and sticks out, which means it's not something that you can wear more than once every couple of weeks, so I didn't think I'd get a lot of wear out of it. Last but not least (ok...least) were these bronze d'orsay flats. First of all, I'm thrilled that Stitch Fix now offers shoes, but I didn't realize that my profile was set so that I'd receive them (I like to stick with clothing, no shoes or accessories). I was surprised to find shoes in my box, but willing to give them a shot. Unfortunately, they picked a style of shoe that is SO not me. I just can't wear this type of shoe - I walk right out of the backs and cannot keep them on. Plus, I just don't like the way they look on my feet. Not a fan of the color either. Just an all-around fail. So there you have it! March was my second 1/5 in a row and once again, I was a bit disappointed. This fix had a lot of potential, though, so I'm not completely over it. I'm not sure if I'm getting more selective about what I'm keeping or if I just haven't found the right stylist, but I felt like this one was closer. I'm considering asking to keep this stylist and hopefully steer her more in the right direction, but I'm not sure if that's the way to go? Anyone had luck with that? *If you're interested in signing up for Stitch Fix, please feel free to sign up using my referral link. Or don't...that's fine too. I've seen a couple different gray shirts in people's Stitch Fix box and I'm with you. Although it is super soft, it is still a gray t-shirt. I like the red blouse on you but if you don't feel it looks good then you will always have that negative feeling when you wear it. Those jeans were cute so it's great they felt great too. I think you chose correctly! I do love that pencil skirt, but I agree, it looks too long! Hopefully your next box is better! I would've kept the jeans too- I'm going through a major jeans dilemma right now where all my pre-pregnancy jeans are just way too BIG. I know, weird. I really need to look into Stitch Fix I've been meaning to for a while. Love those jeans! And I kind of love the gray tee also, but I agree it's hard to dish out 40 bucks for a tee. The skirt is super cute also love the floral pattern. 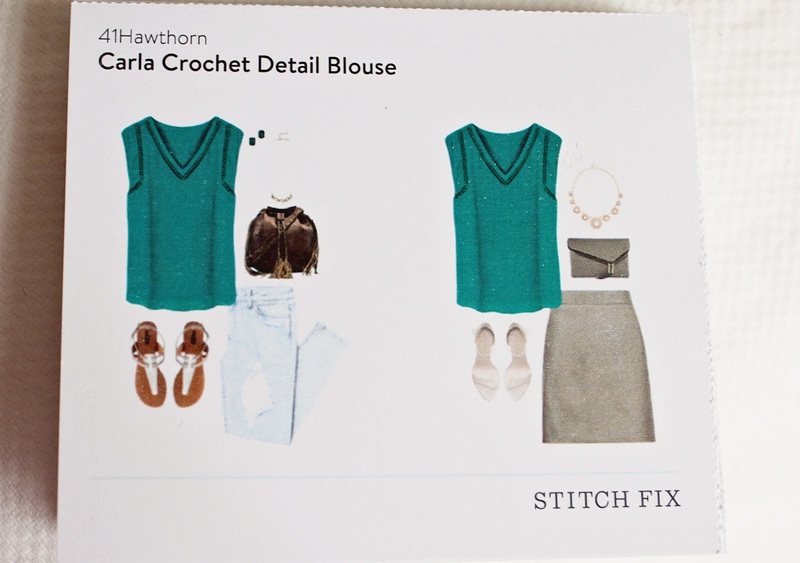 I'd love to try Stitch Fix sometime, it's for sure I could use it! I'm absolutely in love with this post! I'm definitely going to have to check out Stitch Fix now! LOVE that skirt. I want it for myself! You made the right choice though if you don't see yourself wearing it. I need to be more discerning with my clothing. I would have definitely kept those jeans, too! They look great with the Converse, too. I am going to be getting a box next month and I hope they send a pair of shoes! 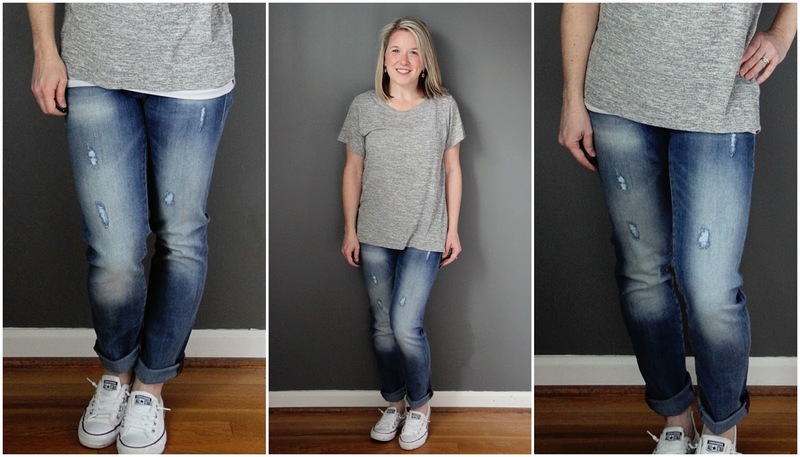 Those jeans are perfect for errands & weekends! So glad you kept them! I like the gray tee. It is so something I'd wear, however the price tag. No thanks. I'd give this stylist another chance. She seems to be headed in the right direction. I like the Market & Spruce shirt and the skinny jeans. The jeans, especially! The shoes were cute, too but I think i'd feel the same way about them you do. I doubt i'd be able to keep them on my feet! Ugh, I hear you on a different stylist each month...I have been SO disappointed lately, but because I love the surprise and potential, I've given them three more months! My next box comes Friday...but I do love the bright top from last month and agree with your choices for this month! I like the red top on you but agree it was too big and boxy. I would like Blake Lively to be my stylist - how do I make that happen? Love that top from your February box!! Are those jeans with it from Stitch Fix too? I went through a few of your Stitch Fix posts to show my mom the other day - I think she would love the service! 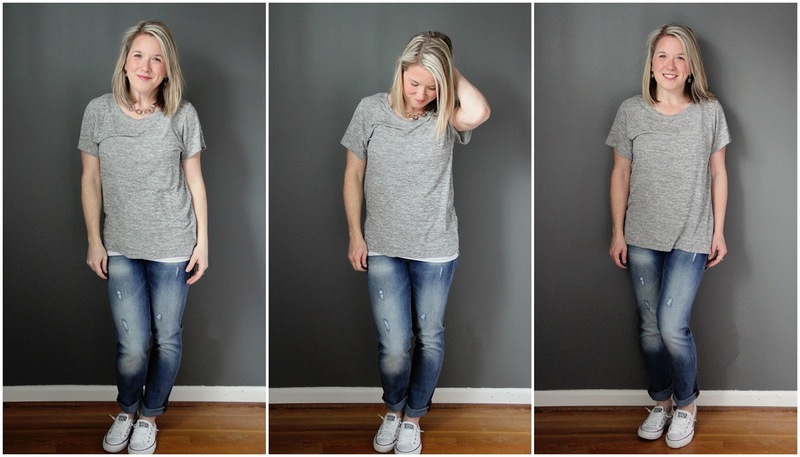 I got a pair of Mavi jeans a while back from Stitch Fix (and ended up buying them elsewhere for less $$) and they are by far my favorite jeans. Mavis are SO comfortable. Several people I know have since bought Mavi jeans (including my husband) and they all rave about them. I wish I had discovered Mavi sooner! Love that green top from your February box!! Love that green top!! Perfect for you! The red top looked so cute, too, but if you aren't comfy, it's not worth it! And how in the world does SF always send the most perfect pants?? But they can't get tops right? Ha! I always keep my pants! I will have to double check my shoe preference...not sure I want to waste an item on shoes!! Love the green top. That is way to much for a T-shirt so I think you made the right choice an it stinks that pencil is too long. This box had a lot of potential if the fit had been a bit better on a couple of the pieces. Great choices! Those jeans look amazing on you. I like them a lot. Ridiculous that a tshirt Costa that much. Wow! Love the green top you got last month. Looks so good on you. Great color! The red shirt looks great on you, but I totally understand how some of the items photograph well but aren't keepers in real life. $40+ for a gray tshirt, no way! Love the jeans... I'm looking for some distressed jeans! While the skirt is pretty I totally get it! And those shoes... Not a fan either and I hope I don't get some in my next shipment! That green top though is beautiful! 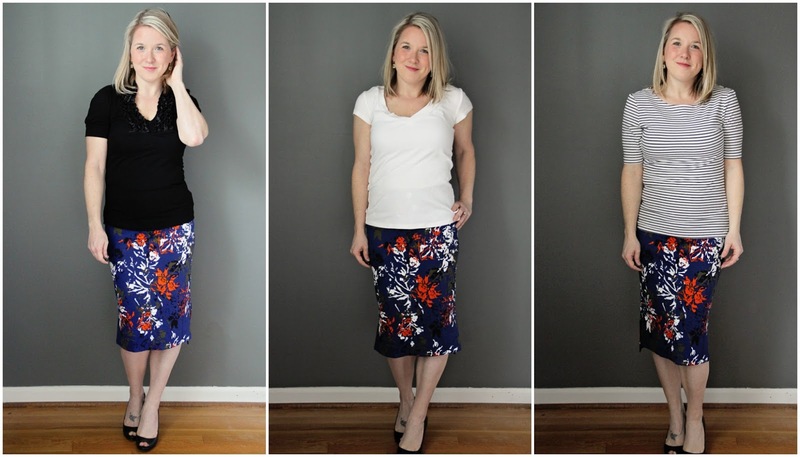 I adore the pencil skirt and each style is perfect on your frame. You look amazing, Sara! Hhmmm a little disappointing this month, huh? Those shoes are something else lol. Bummer that your last two fixes haven't been overly exciting. I did love the red blouse as well as the gray top on you, but I could totally see why you didn't keep them. You know, I actually love everything from your March box (minus the shoes) and think they all look great on you! Problem is, we see pictures, so I don't see the skirt problems, but in pictures I think it's super cute! I also really like the red shirt! BUT I totally understand what you're saying. Tons of people tell me things I returned look good, but I just didn't feel good in them, which is why I returned them and sounds like why you returned some of your things too. For the prices of SF, you have to love them! I LOVE that red shirt but I agree...it looks like it needs to be pinned back, which isn't helpful. I have one more Stitch Fix coming after two really disappointing boxes. I hope I have better luck with these! I do like the red top in the pictures, but hey if you don't like it you don't like it! I really like the bonus top - looks way better on you than in the card picture. The shoes remind me of horse feet..hooves I suppose, which I find pretty random of me. I think shoes would be much harder to randomly find than clothes, but maybe if there was something specific you wanted it would be nice. Love your Stitch Fix posts so much! The first top - LOVED it on you! That is your color, hands down. Maybe sized down though? The grey top was SUPER cute. But $44? Hard pass. Good call. THOSE JEANS!!! I'm pinning the heck out of them. LOVE your February keeper. May I ask what jeans you are wearing with it? Bummer that you didn't keep more pieces! I received that gray tshirt and LOVE it! I wear it all of the time and get compliments that are strange to get for a tshirt. I actually asked them to send it to me in another color as well and received a fun teal green. I know its pricey but worth it for as much as I wear it. The bright red color looks great on you, but I agree about the fit. I am in love with those jeans and think that I need some. And the green shirt is absolutely perfect! Re: Stylists - I found a similar problem, I went through 3-4 Fixes with different stylists and none of them felt 'right.' But as soon as I got one that seemed like she was on the right track I requested to keep her and build a relationship. That was the right decision, she is getting to know my style and needs more with each Fix, which makes the Fixes better every month. For me, it was the right way to go. Follow your instincts and stick with that one for a couple of Fixes. If it doesn't feel right, ask for a new stylist. Your story with the jeans is my favorite thing about SF. How you can be unexcited about something but then try it on and fall absolutely in love.